Three new gene variants behind dominant white patterning in horses have been identified by Australian researchers. They were identified in the KIT gene, which has been studied intensively in various species over its role in white patterning. Researchers Rhiarn Hoban, Kao Castle, Natasha Hamilton and Bianca Haase focused their attention on 14 horses belonging to three horse families. Two of the families were Thoroughbreds while the other comprised Miniature horses. Their genetic analysis focused on the KIT gene, leading to the identification of novel variants dubbed W25 (p.Leu223Pro), W26 (p.Ser846Valfs*15) and W27 (p.Cys491Trp). “It is highly likely that the newly identified variants cause the white patterning in the investigated individuals,” the researchers reported in a brief note in the journal Animal Genetics. One variant found in a Thoroughbred mare in one family was present in one white offspring and absent in two solid-coloured offspring. However, a second female from this family tested negative for this variant, despite its white coat patterning. 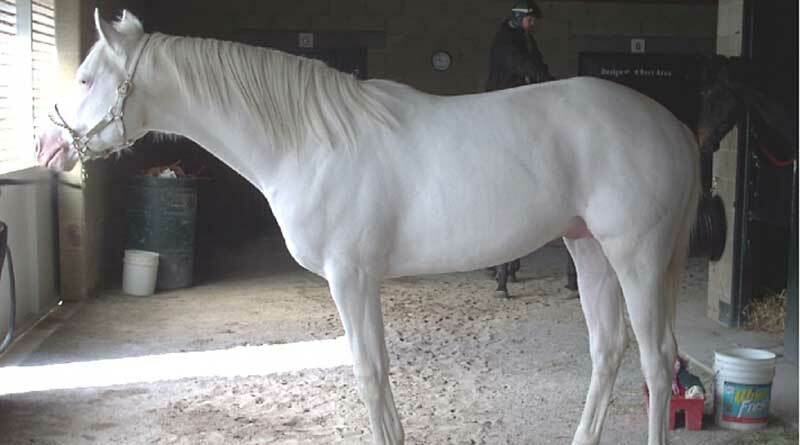 In the second Thoroughbred family, a different KIT gene mutation was identified in a white stallion and his near white offspring. Unfortunately, no solid-coloured individual from this family was available for testing. Pedigree information reveals that all white animals in this family can be traced back to a mare born in 1960. This Thoroughbred line was identified as the first with dominant white individuals reported in Australia. The variant seen in the Miniature Horse family was found to have been previously described in Quarter Horses. “Although it is unlikely that this variant originated in a common ancestor of these two horse families, it cannot be completely excluded,” the researchers said. All three are known as missense mutations, in which the change means it codes for a different amino acid. In effect, it is misread. Hoban and Haase (Waud) are with the School of Veterinary Science at the University of Sydney. Hamilton was formerly with the university’s School of Life and Environmental Science, but is now director of the Equine Genetics Research Centre. Castle is with Practical Horse Genetics in Redfern, New South Wales.